In this article I am going to show you how to sell on Facebook using Shopify. 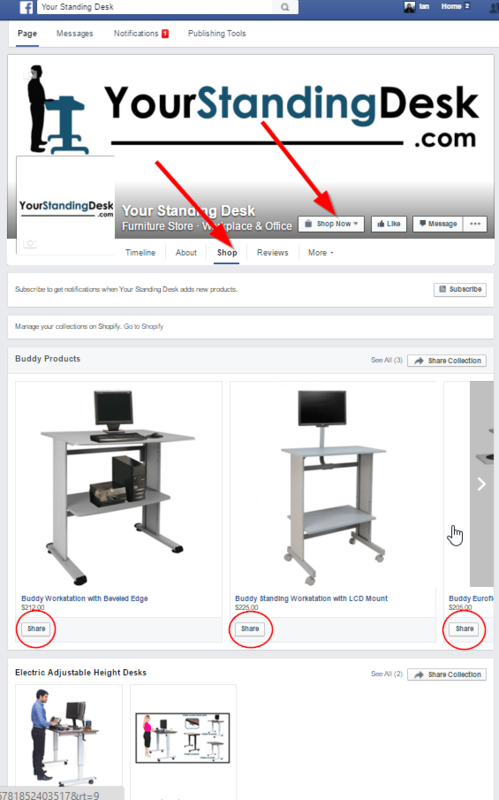 You’ll learn how to to list and sell your products in a Facebook Store in 5 easy steps. Ability to list your products and have them purchased directly from your Facebook page. 2. Ability to share individual products with your Facebook fans through the news feed..
3. Ability to increase the number of people that see a post promoting your product. 4.You can provide customers the security of buyer protection from Facebook. During checkout, potential buyers will see the message, “Secure Checkout on Facebook with buyer protection”. How to Open a Facebook Store Using Shopify in Just 5 Steps. Setting up a Facebook store using Shopify will only cost $9 a month. Plus, even if you’re starting from scratch, this will take just a couple hours to get set up. I will assume if you’re reading this article that your business has a Facebook page and that you have more than just a handful or products to sell. If you’re business doesn’t have a Facebook page, read our Guide to Set Up a Small Business Facebook Page. 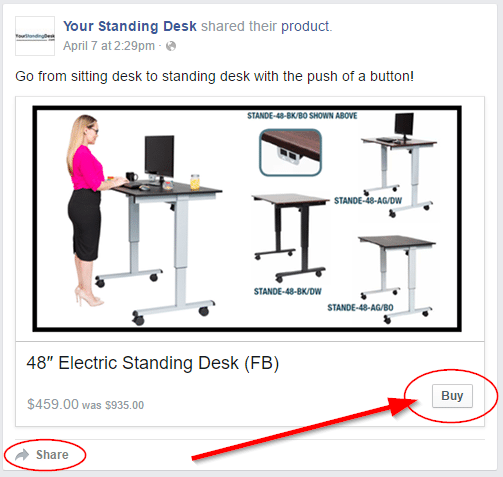 The first step to sell on Facebook is listing your products on an ecommerce platform. I prefer and use Shopify. Once your products are listed on Shopify, integration with Facebook Shop takes seconds. Once you have your small business’s Facebook page set up, it’s time to get your products on an ecommerce platform. An ecommerce platform is a place that allows you to list, display, and sell products online. I recommend using Shopify because it is easy to use, versatile, and very affordable. In fact, this is who I use for my store, YourStandingDesk.com. TIP: It’s a good idea to have a few store name ideas in mind. If the store name is already taken, Shopify won’t allow you to move forward. Next, you’ll be asked for information about the stage of your business. Shopify asks for this information so they can better assist you with setup. The process for a well established business that has been selling from a storefront for years will be different from the process for a new home business that hasn’t made a single sale yet. At this point you have successfully registered with Shopify and you’ll be taken to your administrator Home Page. Next up is adding your small business’s products. Once your products are listed in Shopify ecommerce platform, integrating with Facebook Shop just take a minute. 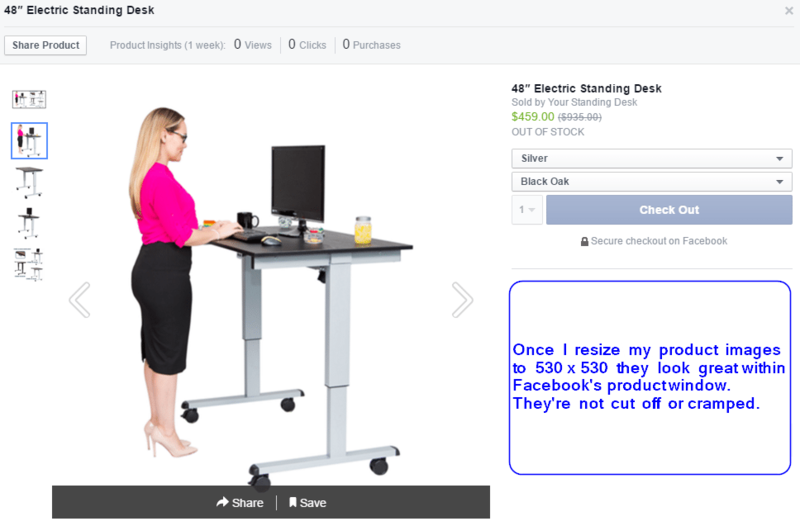 I’ll use a standing desk like I sell in my store, YourStandingDesk.com, as an example. Specifically, I will use a Luxor 60″ Crank Adjustable Standing Desk. First, fill in the Title of your product. Then complete your product description. This is really no more difficult than working on a Word document. 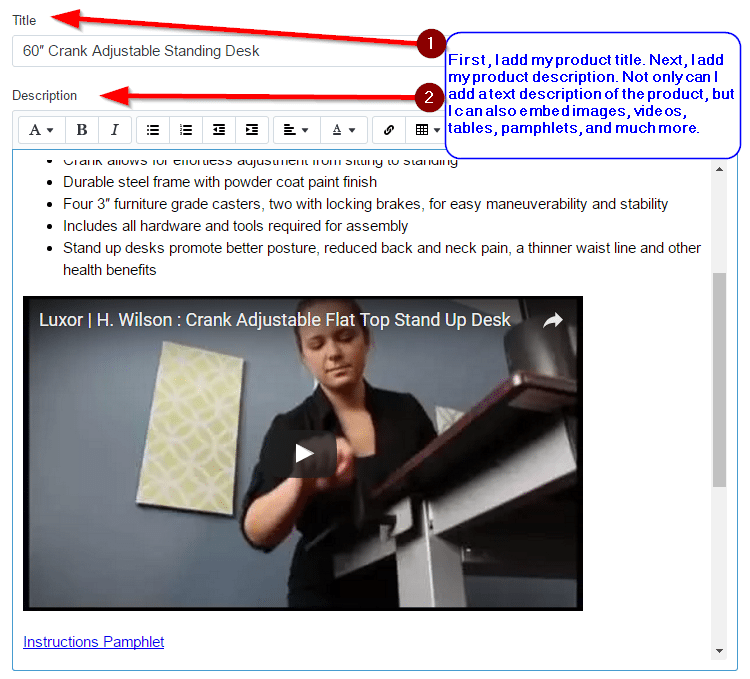 Add text, insert hyperlinks, and even embed video if you want to. Next, I add images of my products. Customers will be able to browse through the various images (and even zoom in for a better view) when deciding on their purchase. Next, I add the information for Pricing, Inventory Tracking, and Shipping. Shopify will actually calculate and charge for sales tax and shipping on your orders. 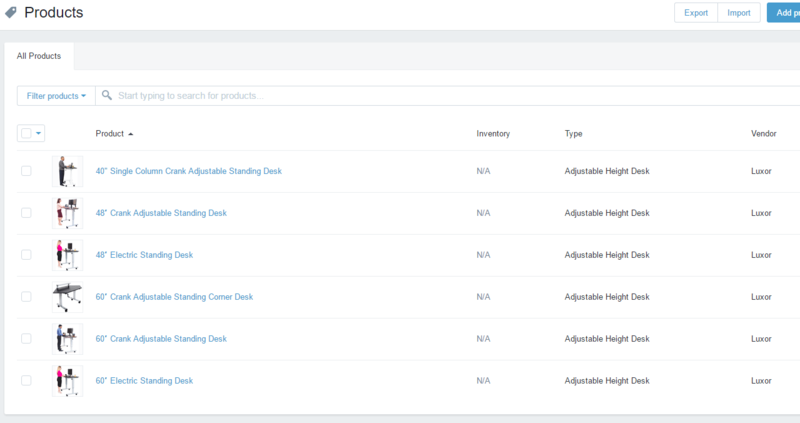 It will also deduct orders from the inventory totals you input so you don’t sell products that are out of stock. If your product has multiple variations (like sizes, colors, materials, etc), you don’t have to list all the possible variations as individual products. 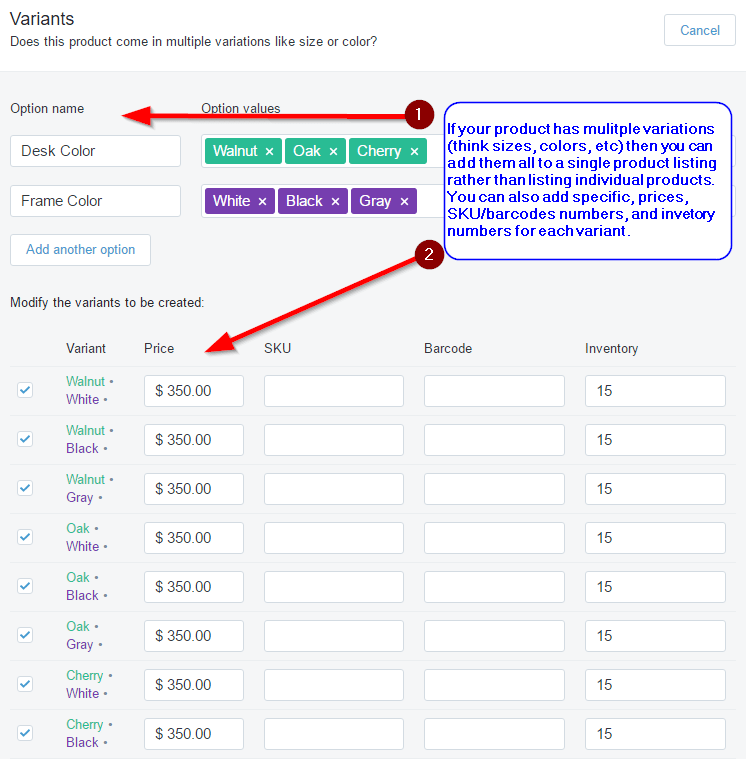 By noting “Variants” Shopify will list all the possible variations under one product listing. If needed, you can still set different pricing or inventory numbers for each variation type (like if a certain material is more costly). Finally, I fill out the “Organization” tab on the right side of the page. 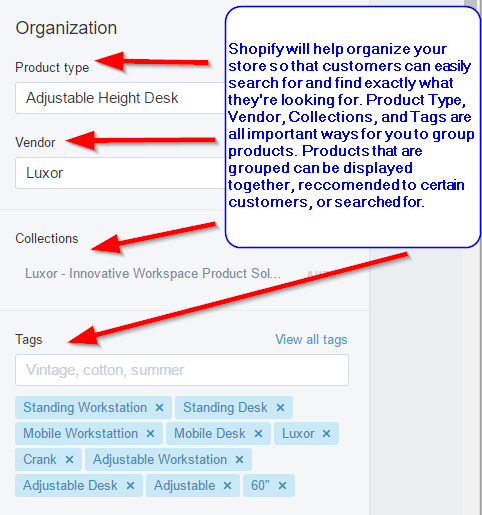 Using Shopify’s “Organization” tools will help you increase sales. It allows you to automatically group together brands, custom collections, or similar products or features making it easier for your customers to find the products they want. Once I have filled out everything on your product page, make sure to click “Save” at both either the top or bottom of the page. Note: Collections are custom groupings. They allow you to curate specific groups of products you think customers might like together. Want to learn more, check out my complete shopify guide. 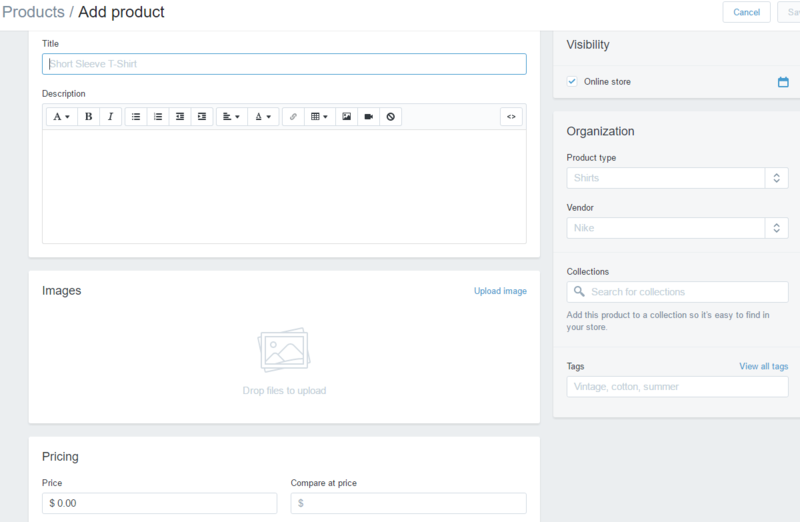 If you’re adding products similar to ones you’ve already added to Shopify, rather than starting a brand new product page, select the existing product and hit the duplicate button in the top right corner. You’ll end up with an exact copy of the title, description, images, tags, etc. This is such a powerful tool and time saver. 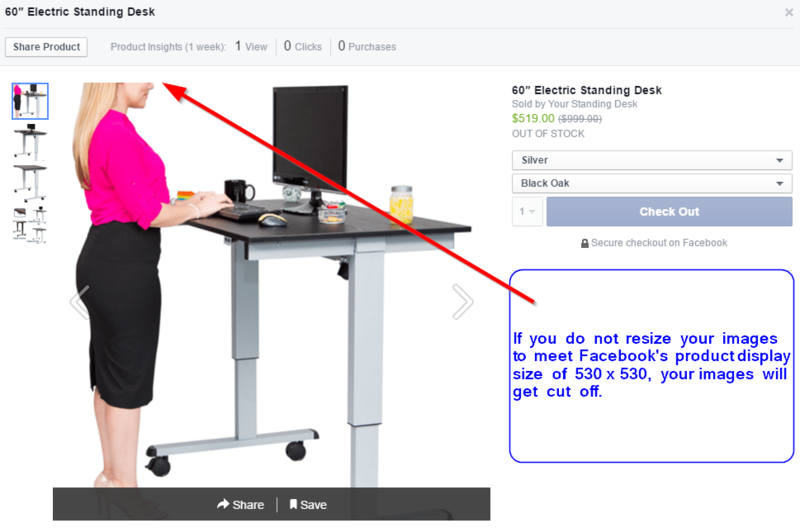 When I wanted to add a 48″ Crank Adjustable Standing Desk I just duplicated my 60″ Crank Adjustable Standing Desk and then changed the dimension, pricing, and pictures accordingly. My second product was listed in seconds! Before you know it, you’ll have listed all of your products on Shopify and be ready to integrate those listings with your business’s Facebook page. Once all of your products are listed on Shopify, you’re ready to integrate your Shopify and Facebook accounts. Integration is easy and takes just a couple minutes. At this point, you should still be in Shopify. Return to your administrator home page. In the center of the page you’ll see a heading that says “Where would you like to start selling?” Select the “Add Facebook” tab. You’ll be asked to log in to your Facebook account. Once you do, you’ll be asked to select which of your Facebook pages you’d like to connect with. 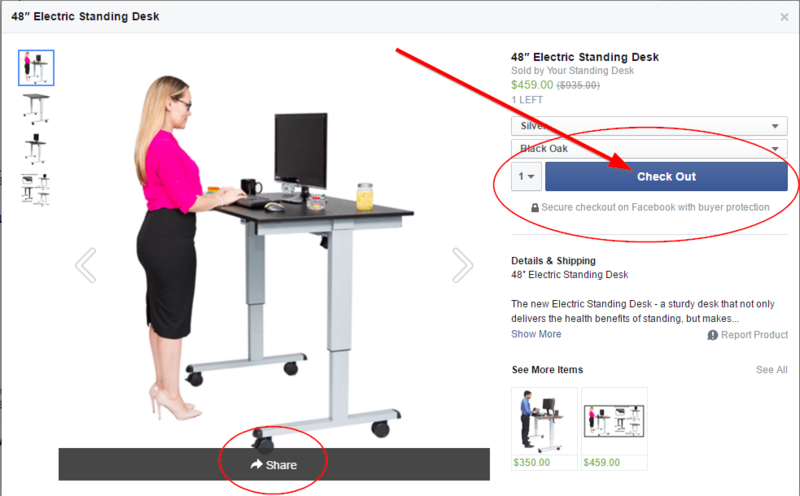 I would select Your Standing Desk’s page. Once I accept terms and conditions I will be directed to the Facebook admin page within Shopify. It will confirm that integration with Facebook was successful and ask me to choose how I prefer to have customer checkout. I recommend choosing to have your customers check out through Shopify. In a separate browser window, you can log into your business’s Facebook page. 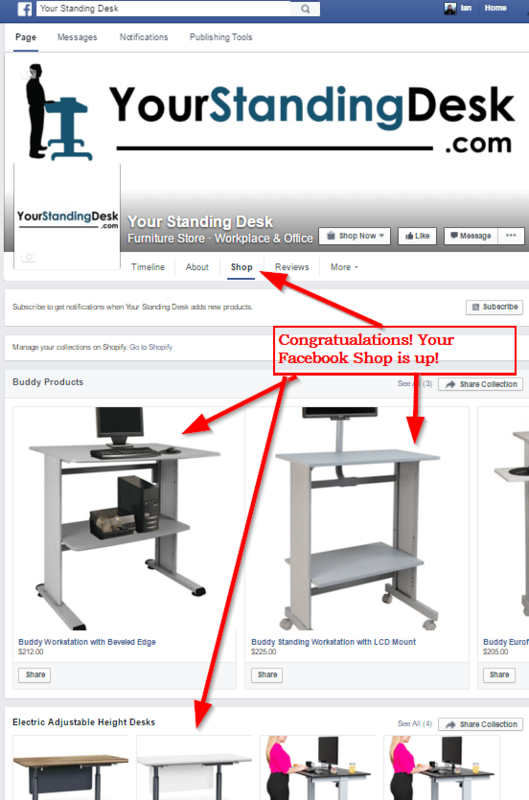 Select the “Shop” tab and you’ll now see all your products listed on your Facebook page! When customers click on a product listed in the Facebook Shop they’ll see a window with all the product information. They’ll also have the option to share the listing on their own page, like or save the listing, comment, and most importantly, to buy the product. Selling on Facebook is all about images. 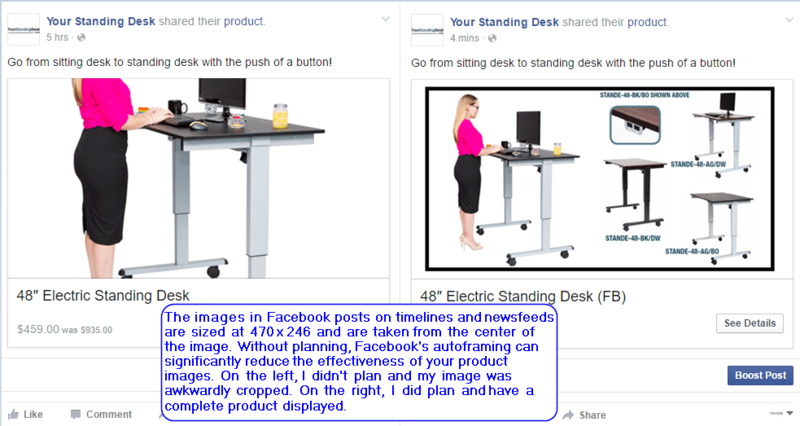 You not only need quality images, you also need those images to fit Facebook’s formatting. 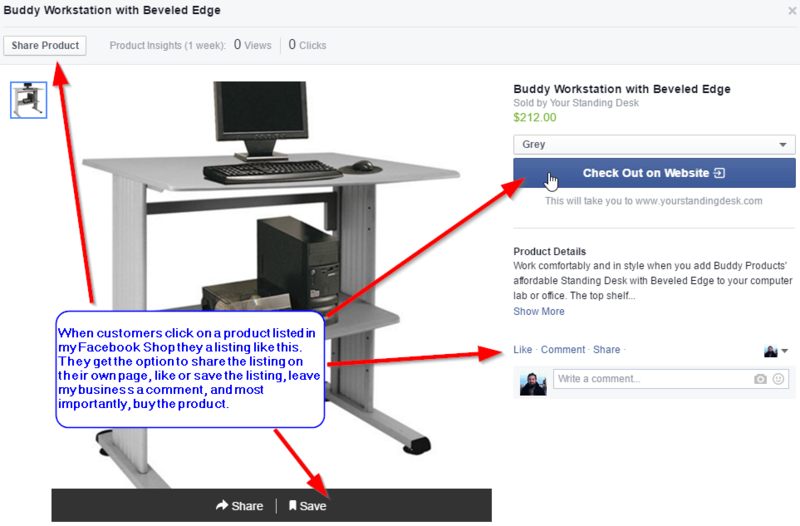 When I first integrated my Shopify products with Facebook I noticed a glaring problem: images that looked great in Shopify were getting cut off in Facebook Shop. 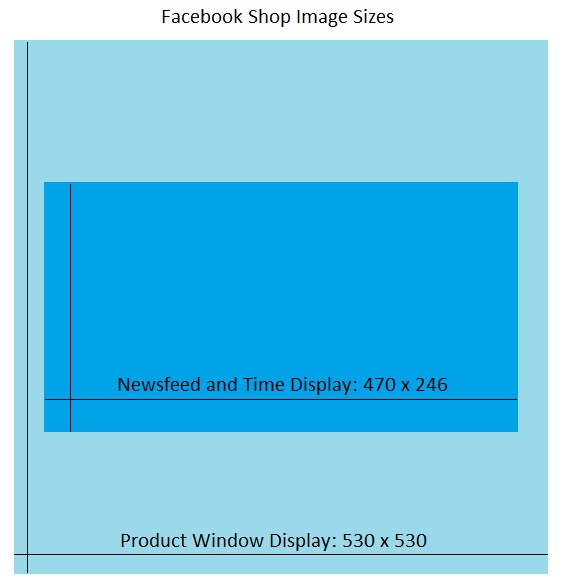 Not only that, but images posted on Facebook’s news feed or Timeline were displayed differently than what appeared in my Facebook Shop product display window. With this is mind, I needed to resize my images to fit the Facebook displays. To read my full article on sizing images for Facebook, click here. If you will be selling your products on your Facebook Store only, congratulations, you can skip to Step 5 and get ready to accept payments and make sales! If you’re like me and planning on have other sales channels (like selling on your own website) then you have an additional step. It will be a little extra work now but will ensure your product images look great no matter where they are being displayed and that will help your bottom line. A primary image that is optimized for Facebook’s timeline and news feed might not be the same image you want to use as a primary image on your online store. You may not want to use square images for your products on your website. Shopify makes solving this problem easy. 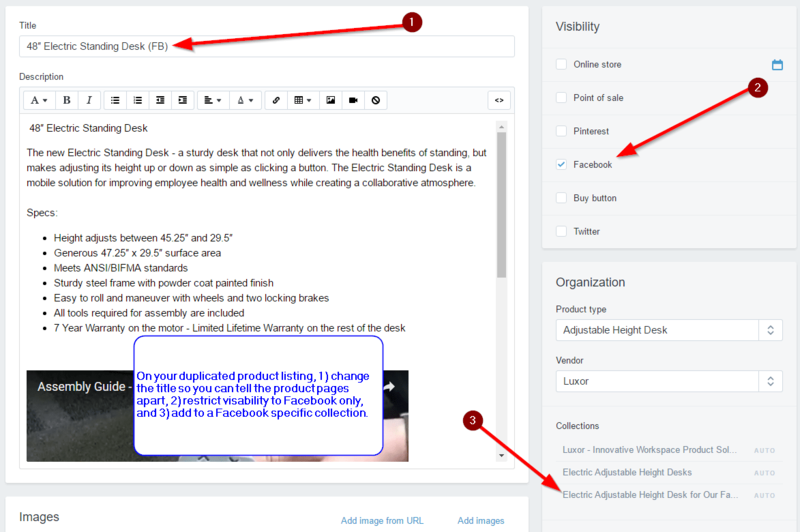 All you need to do is duplicate your product listing, swap in your Facebook optimized images, restrict the visibility to Facebook only. If you are selling many products you will also want to add Shopify Collections that are visible on Facebook Only. 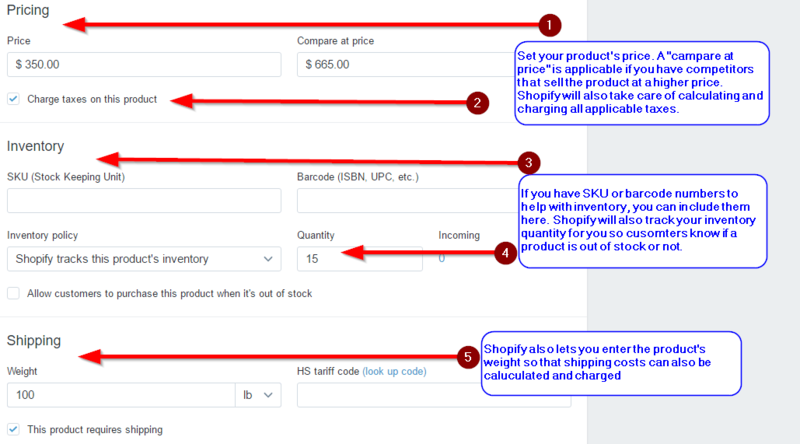 To do this, select a product in your Shopify Product page. In the upper right hand corner, click duplicate. 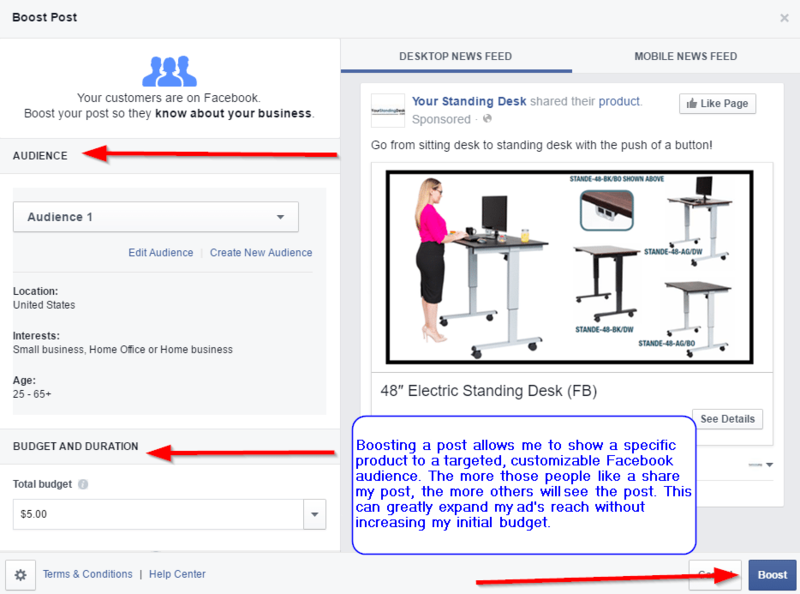 Once, you’ve duplicated the product page, edit the title, restrict the visibility to Facebook only, and add to a Facebook specific collection. Then swap in your Facebook optimized images. At this point you have created a Facebook page for your small business, registered for Shopify’s free 14-day trial, listed your products in Shopify, and integrated your Shopify product listings with Facebook Shop. You’re almost ready to sell on Facebook Shop. The last step is providing Shopify with your business and banking information. Shopify needs this information in order to process payments for you and to be able to provide you with the proper tax documents at the end of the year. To enter your business and banking information, click on the Settings tab on your Shopify sidebar and then select the Payments tab. Once you’ve provided Shopify with your business and banking information, you’re ready to go! 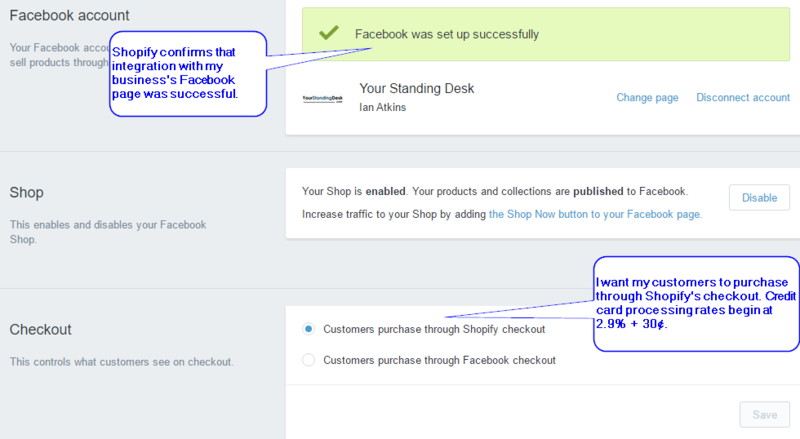 You’ve successfully set up a Facebook Shop using Shopify in just a few hours without paying a cent. Selling on Facebook is easy with Shopify. Setting up a small business Facebook page is free. When combined with Shopify’s versatile ecommerce platform you have a way to sell directly to the customers that love your product the most. Facebook Store integration is available on all of Shopify’s Plans which start at $9.99 per month. 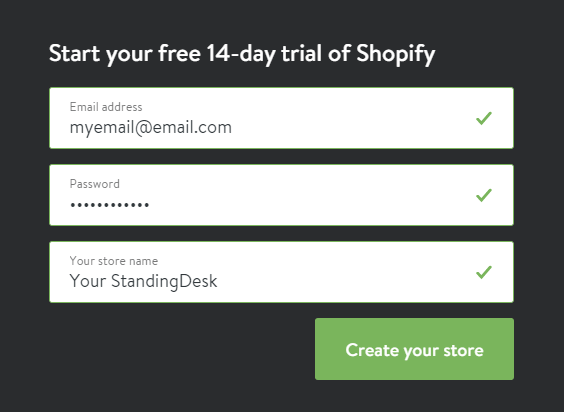 Plus, you can try Shopify for free for 14 days. Now that your Facebook Shop is ready for customers, check out our Guide to Facebook Advertising. Am from Ghana in Africa. Is it possible to integrate my business and banking information with shopify outside the USA? That’s my only concern . Would be glad to hear from you soon. Hi, this page from Shopify should answer your question. You can use Shopify outside the US, UK or Canada, but you’ll need to use a separate payment processing service. Any helpful hints to have the item description in Facebook in a more readable format since rich text from Shopify doesn’t get translated over to Facebook? I noticed that it drops the bullets on my list of features, so I know what you’re seeing. I don’t have a quick answer but let me do some digging. If I find a solution I’ll post it here. They make it so simple, there’s no reason not to do it. We also have a new article here about setting up a Facebook Shop. We walk through the Shopify process and talk a bit more about the Facebook Shop in general. I think you’ll find it helpful. Dam that was a great piece of info the screen shots. thank you so much..only one thing. can i have multiple fan pages selling different products? You can only connect 1 Shopify store to 1 Facebook page, they don’t let you connect the same store to multiple pages. But you certainly can have a separate store for each Facebook account. If you only want to sell on Facebook, Shopify has a $9/mo. account, but just don’t get a full Shopify store with it, just a product feed. That can be a cheaper way to sell on several Facebook pages. creating a facebook store with Shopify involves an additional cost that ads up to the cost of a plan? Or is it included in the cost of the plan? 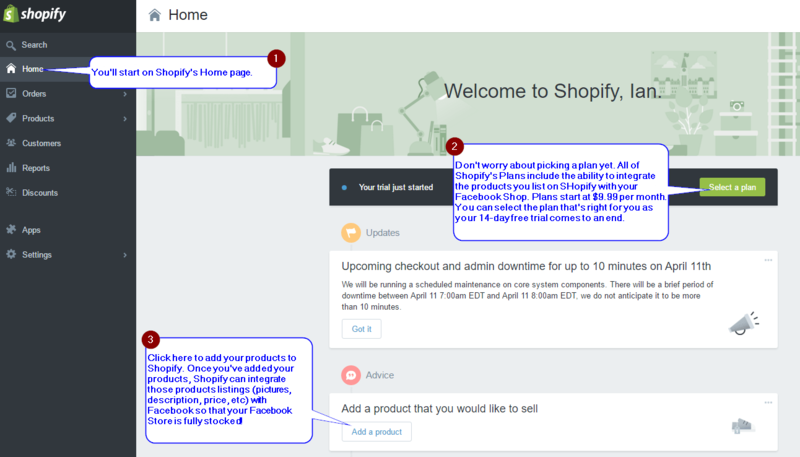 Shopify’s integration with Facebook Store is included in all of their plans. Read our article to see more about how much Shopify costs and what’s included in their plans.